You’ve likely seen one of the multiple ads with celebrities trying to convince you of all the benefits of a reverse mortgage. And if you’re at that age where retirement is within eyesight, a reverse mortgage can begin to see enticing, but honestly when choosing home mortgages you need to be extra careful. The goal and promise of a reverse mortgage is that it allows older homeowners (it’s reserved for those older than 62 years of age) to access the value of their home without them having to rent or sell the property. Instead of like with a regular mortgage, a reverse mortgage is where the bank or lender pays you on a monthly basis. However, it is still a loan. While it doesn’t have to be paid back as long as the homeowners still reside in the house, it does at some point have to be paid back. Still, in terms of a supplemental income, a reverse mortgage can seem like a great idea. But is it? Before opting for a reverse mortgage, consider these seven reasons for why you should never get one. No one likes to think about it, but it’s inevitable that as we get older, there may be a day when we are unable to fully take care of ourselves. A reverse mortgage works so long as you keep living in the home. That being said, you have to consider the possibility that you may need to move to a nursing or assisted living home at some point in your elderly life. If that’s the case, you’re then forced to pay off the loan you received from the reverse mortgage. Between the expensive assisted living or nursing home bill and the payments on your reverse mortgage, it could become too much to handle. This could ultimately leave you homeless. Reverse mortgages might seem like a great supplement, but the mortgage itself can be extremely expensive. Thanks to all the fees, a reverse mortgage could cost you over 10 percent of the actual loan amount. Since reverse mortgages have more regulations, they also have more additional fees. From closing costs to mortgage insurance fees to an origination fee, the cost of fees alone might offset the benefit of the mortgage. Since you’re not the one paying this time, you can get the illusion that interest doesn’t exist. Of course, the case is quite opposite and interest will add up. The lender or bank ultimately charges you interest on the amount that gets carried over year after year. Ergo, if you fail to pay down your loan, the size of it will just continue to grow each year. Again, while the money is enticing at first, it could cost you more in the end. Benefits allotted by the government, like Medicare and Social Security, can’t be touched. However, should you sign up for a program like Medicaid, you just might be. You’re only allowed to make so much to qualify for programs like Medicaid. This means you have to be wary of how much is taken from your mortgage so that it doesn’t go over that limit. If you’re considering a reverse mortgage at all, it’s imperative that you review the parameters of your benefits first. If you planned on leaving your children and relatives a significant amount, including that which passes on in your home and its equity, a reverse mortgage is definitely not for you. With a reverse mortgage you only serve to decrease your home’s equity and increase your debt. Moreover, should you pass on before the loan is paid, you won’t be able to leave the home to your heirs. For if you pass before it’s paid off, your home is usually foreclosed on so the bank can get the money back that it lent you. That being said, if the home sells for more than the loan amount that income will go to your beneficiaries. Still, if you plan on leaving your heirs your home or plan on leaving them money based on the equity, a reverse mortgage can severely complicate matters and leave your finances in no great shape for your relatives. Whether you live with a relative, friend, renter, or spouse, whoever you reside with won’t likely be on the loan with you. If that’s the case, that person won’t be able to live within the home should something happen to you. This is especially something to consider if the person you live with isn’t at least 62 years of age, as they then don’t even have the option of being a borrower for the mortgage. Carefully consider what might happen to your loved one should something impede your ability to live in your home with a reverse mortgage. One of the ways lenders try to entice you into a reverse mortgage is by putting the idea in your head that you’ll never lose your home and ultimately live there forever. However, depending on your retirement income, even with the money from your reverse mortgage, the home insurance, repairs, and property taxes could become too much for you to handle. Should you fail to be able to pay for any of those expenses, you’ll be in severe risk of losing your home. Moreover, there’s no telling how much repairs an ultimately equal. Like many other products and ideas that are advertised on television, a reverse mortgage can truly begin to seem like a good idea. Of course, there is so much more to a reverse mortgage than what’s advertised. By opting for a reverse mortgage, you’ll get much more than more money for your retirement or lifestyle. Taking out a reverse mortgage could have other, detrimental consequences to you, your finances, and even your family. Carefully consider all the reasons a reverse mortgage might not be a good idea. If the benefit doesn’t outweigh them, I’d consider adjusting your lifestyle instead. 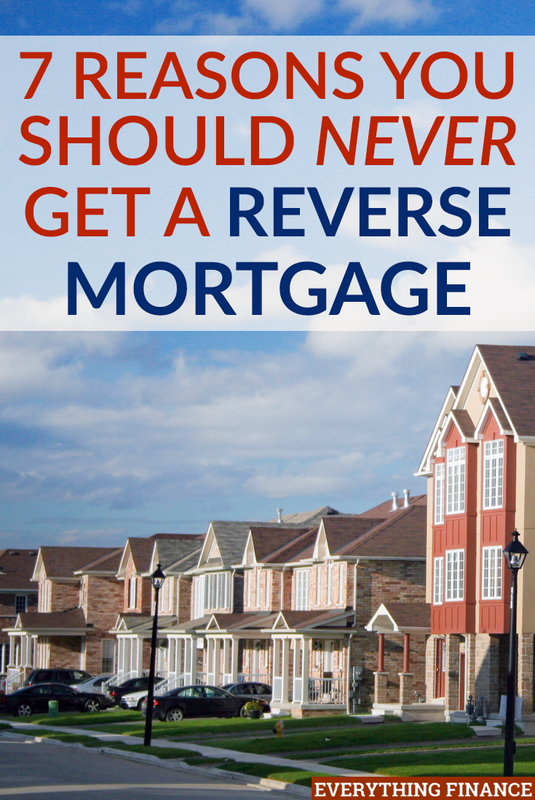 Do you know anyone who’s taken out a reverse mortgage? Did it ultimately benefit or hurt their situation?